Jude Stamper, a 12-year-old Mormon from Monroe, Michigan, was born with Arthrogryposis Multiplex-Congenita, a disorder in which joints are not formed correctly and cannot bend normally. He loves sports; however, he is confined to a wheelchair with limited mobility. 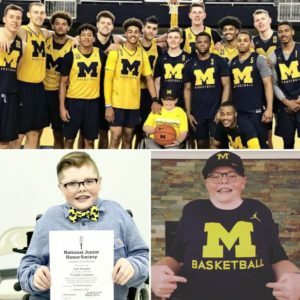 His hopes of ever being an active part of a team were nothing more than a dream until recently when the University of Michigan basketball team and Team IMPACT made it possible for his dream to come true. 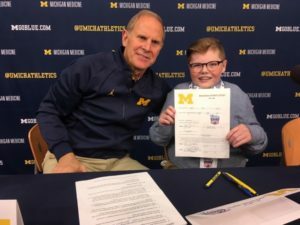 Jude signed a National Letter of Intent with the Wolverines on 6 November 2017 which coincided with National Signing Day. Coach John Beilein told Landof10.com, “We are so very pleased to welcome Jude to the Michigan basketball family. Jude brings great passion and enthusiasm to this program and we are honored to have him on our team. We will continue to work hard toward another championship and know that Jude’s presence will be an important part of our journey.” Jude goes to practices, watches film, and even has dinner with the team at times. Michigan basketball signed him for the game against the Rutgers on 21 January 2018. He was honored mid-court prior to the game. He was joined by his father, Nate, along with members of the Maize Rage, Michigan’s student section. He was given a Maize Rage T-shirt during the ceremony. Several people, including Jalen Rose, current sports analyst for ESPN and former player for Michigan, head coach, John Beilein, the coaching staff, and Maize Rage members wore Block M bow ties in Jude’s honor. Courtney also recalled her first routine ultrasound while pregnant when she found out that Jude could not move his legs. The doctors told her and her husband, Nate, that they should consider terminating the pregnancy. 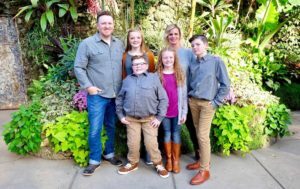 However, they told the doctors that terminating the pregnancy was not an option and “[they] would have [the] baby and leave it up to the Lord.” When Jude was born, doctors told Courtney and Nate that he would never be able to walk. Courtney Stamper is a convert to The Church of Jesus Christ of Latter-day Saints. She was baptized at age 23. She and her husband Nate were high school sweethearts. She and her family are one of two LDS families at their kids’ school, Triumph Academy. She further commented that it has been a great way for Jude to let his light shine and to be an example to others.